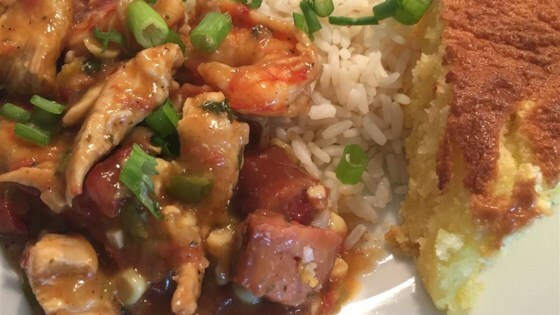 "Delicious chicken gumbo consistency with tomato base. Makes plenty to last for several days. Serve over hot cooked rice and sprinkle with filé powder, if desired." Add chicken, tomatoes with green chile peppers, mushrooms, parsley, Worcestershire sauce, garlic, soy sauce, sugar, salt, pepper and hot sauce. Stir together, cover and simmer for 20 minutes. Add chicken broth or water if mixture is too thick for your liking. I'm not a gumbo expert, but I felt like this dish was lacking a little something.